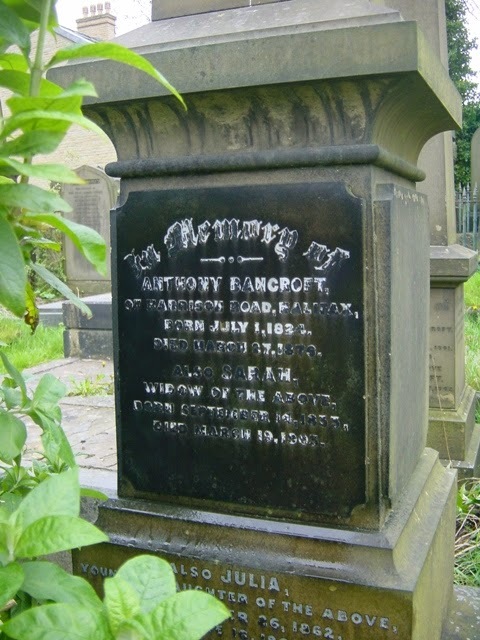 Bancrofts from Yorkshire: Bancroft burials at Lister Lane Cemetery, Halifax. This blog is produced to assist all genealogy researchers of BANCROFT families originating from the county of Yorkshire. Bancroft burials at Lister Lane Cemetery, Halifax. 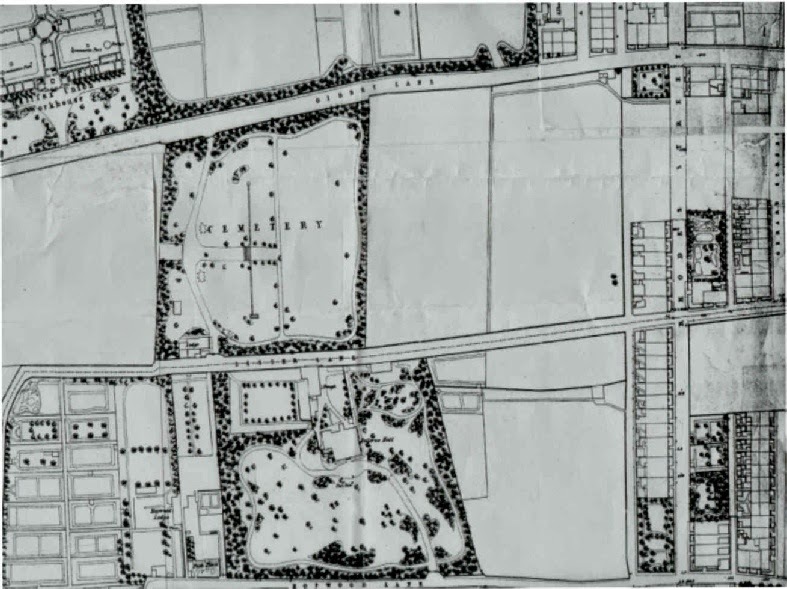 The cemetery was built over several years on open fields, opposite a large house belonging to a member of the Crossley family, who was a large benefactors and was part of the family of Carpet Manufacturers in the town, and who is buried in a family vault there. The following map shows the area soon after its opening. Originally known as the Halifax General Cemetery, Lister lane, it covers three acres of land, and has a raised terrace with views across Halifax to Beacon Hill. It is registered on the list of Historic Parks and Gardens, and has some interesting monuments, particularly the gothic spires and obelisks along the main pathway. Most of the brick built vaults are beneath this terraced area, and were constructed with a depth of about 25 feet. 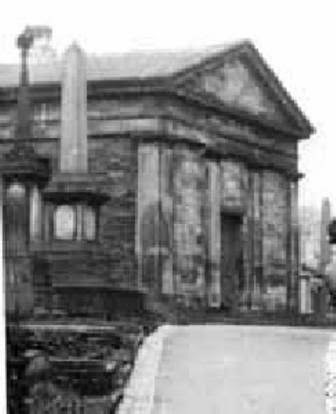 Within the grounds stood a small non-denominational chapel, built in the neo-classical style, which is still there today, although sadly in a pretty poor state. Pictures below show it in its heyday, and how it is today. 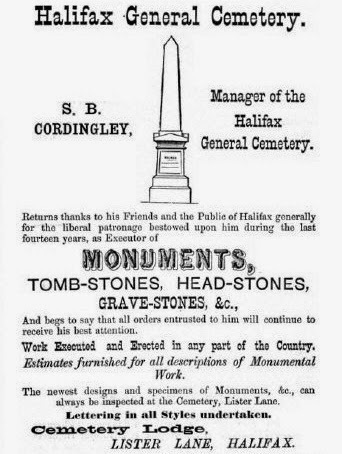 The graveyard’s memorials provide an index of the people who shaped the development of Halifax during its period of spectacular growth in the 19th Century, a period which defined the way the town still looks today. Many of the town’s great and good were buried there…… Judges, JP’s, Baronets , MP's , Mayors, Industrialist’s, Waterloo Veterans…. the list goes on! I was recently sent a full listing of the 53 Bancroft individuals who were buried at Lister Lane Cemetery in Halifax, which makes heartbreaking reading, when you see the ages of some of the individuals buried, and can be viewed by clicking here. The list of Bancroft burials includes some poor people who obviously could not afford a plot of their own, so had to be buried in public graves, and most of these graves go unmarked and are under paths in the cemetery, such as the one shown on this picture, which reputedly has several hundred men, women and children buried beneath it. '17 hours, 1 hour, 10 minutes' etc. The last burial was in 1969, but in reality the majority of the 20,000 burials in total, took place between 1846 and 1918. 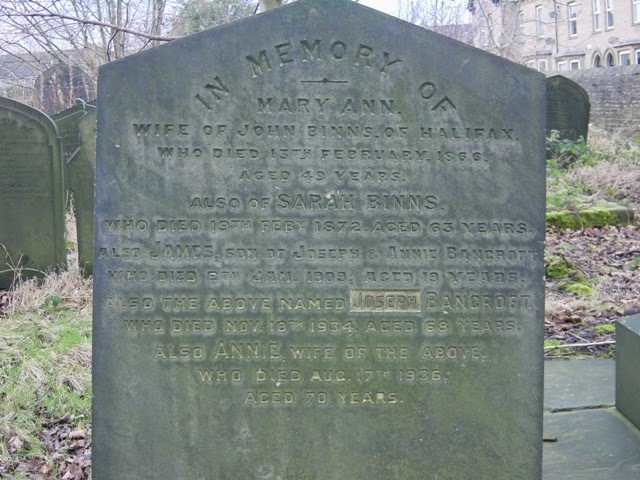 The first grave is the last resting place of John and Mary Bancroft [nee Lees] and their family. 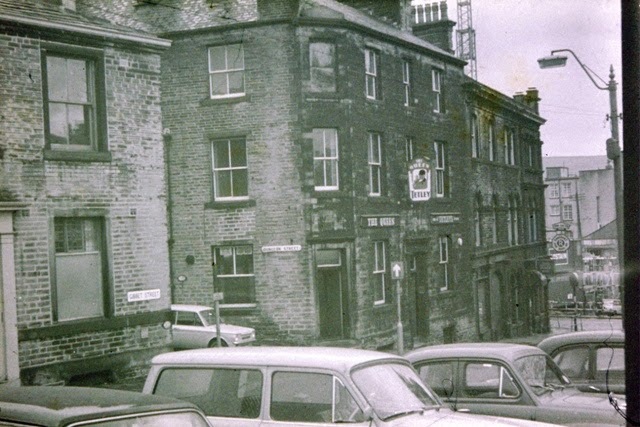 John was the son of Anthony and Hannah [Howarth] and started his working life as a weaver, before becoming the Publican at the Queens Hotel in Gibbet Street, Halifax during the 1840-50’s. The hotel was a large establishment, as can be seen from the photograph below taken not long before it finally closed in 1968. The 1851 census showing John and family living on Gibbet Street in Halifax, without actually mentioning actually the Queens Hotel. At the time of his death in 1858, he was listed on the burial records as a stone merchant, but when his youngest son Fred married in 1874, he was shown on the marriage record as a deceased ‘straw merchant’. His three eldest sons, George, William Henry and Frederick went on to set up a large business in the down as Brush Manufacturers, and their story can be read by clicking here. For some reason the grave and gravestone are positioned the wrong way round to all the other ones in the area…the question is why?....possibly because it is a fairly early grave to the site, first used in 1851, just 10 years after the graveyard opened, so it may have been one of the first to be used in this section. The above two gravestones are of James & Ann Bancroft[ nee Walker] and their son Anthony and his family, who ran a well known Druggist business in the town. The business was handed down through three generations, and I wrote an interesting article about the whole family, their business, their emigration to the US and their return, which can be read by clicking here. This is the grave of James and Ann Bancroft, who became a sweet manufacturer in the town, having started by making toffee and sweets in the cellar of his house. Census records show him as a ‘Master Confectioner’ living at Gibbit Street in the town at the time of the 1851 census. On his death the business passed on to his son Charles who sounds a bit of a character. Family folklore says he liked to drink and after taking his confectionery products to market by horse and cart, was in the habit of spending his takings on the way home in the pub, and after having had one too many, had to rely on the horse knowing the way home! Charles died at the early age of 47 years, and on his death the sweet business was sold to the Macintosh family who went on to become a major national manufacturer of confectionery. Interestingly the burial record for Charles lists his occupation as ‘Spice Dealer’…’Spice’ being the old fashioned Yorkshire term for sweets. The full story of this family dynasty can be found by clicking here. 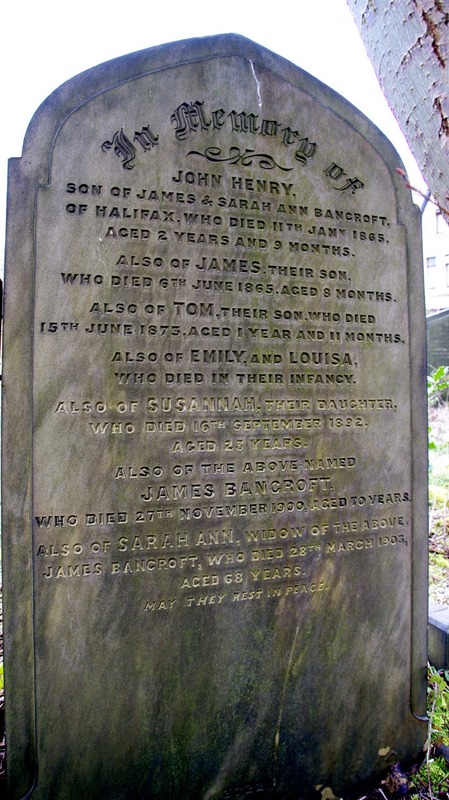 Shows the grave of James and Sarah Ann Bancroft, together with 3 of their infant children who died aged 8 months and 2 years. James was described as an ‘Engine Tender’ and later as a ‘Cotton Rover’. He was the son of Elijah and Susannah, and Elijah was buried in this graveyard, but had to be buried in one of the public graves probably as a pauper. Elijah's wife,Susannah, was however given some dignity because she was buried with her son’s family in this grave, rather than in a public pauper's plot. 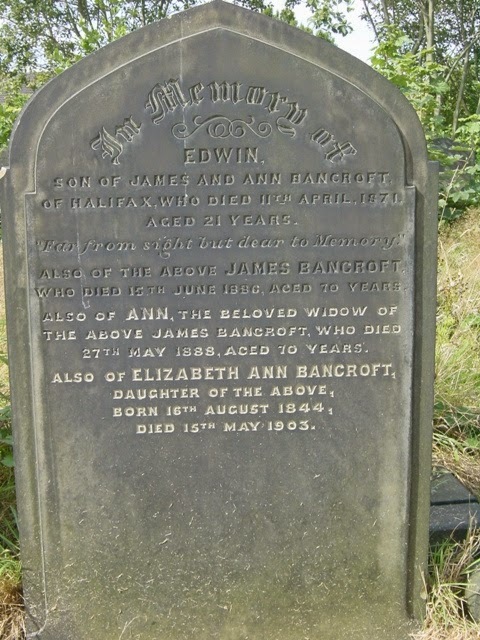 The newest Bancroft grave on site is that of Joseph and Annie Bancroft, together with their son James, who was the son of the above mentioned James and Sarah Ann. Little is known about him other than the fact that the records show him as a ‘Goods Checker’ on the 1911 census shown below. In collaboration with Calderdale Council, the ‘Friends of Lister Lane Cemetery’ was formed in 1999.This group of volunteers promote the upkeep and public profile of the site, largely unfunded. New members and supporters are always welcome. For more details about this, please go to the ‘Friends’ website by clicking here. "IT'S A MEAN OLD SCENE"
Woolcombing in Yorkshire - A Dirty Business ! How did 'Flappit Springs' get it's name? How did " Deep Arse Delph" get it's name?